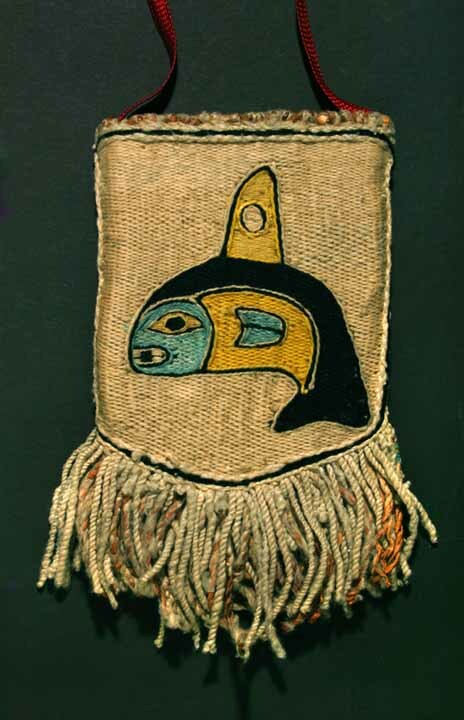 NA- 2699- THE TLINGIT CHILKAT WOVEN POUCH REPRESENTING A KILLER WHALE. circa third to last quarter of the 19th Century. Woven custom, as a Chilkat blanket would be, with goat's wool, goat hair, cedar bark, and natural dyes. An exceedingly rare object. 1) Purchased by George G. Heye at Chilkat, Alaska. 2) Catalogued into the Museum of the American Indian, New York in 1927, Accession No. 15/4376. 3) Exchanged to the Textile Museum, Washington, D.C. in December, 1962. 4) Exchanged to the Alan R. Sawyer Collection, former director of the Textile Museum. The early provenance and collection history has been verified by a research specialist for the National Museum of the American Indian.